“Advertising can bring the horse to water. The flavors will get them to drink. And the nicotine will keep them coming back for more,” a CDC official says. Juul has come to dominate the e-cigarette market with its slick devices and nicotine-laden “vape juice,” and that’s not a good thing, federal health officials said Tuesday. 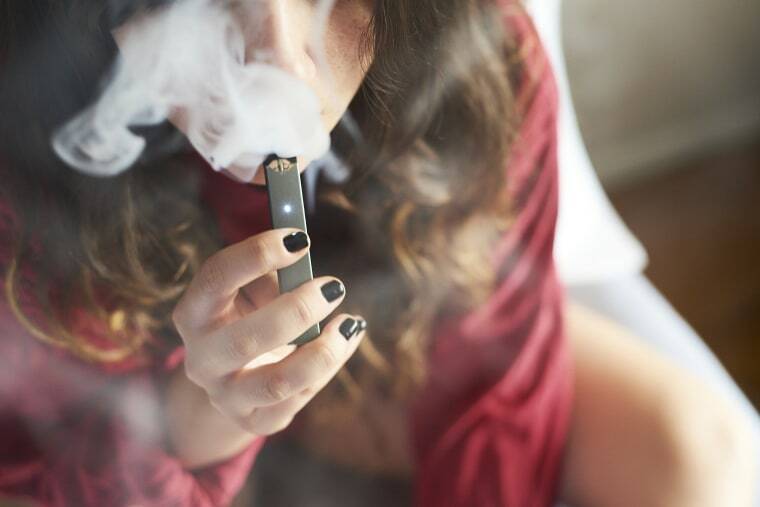 Juul sales have soared, and it’s now got the greatest market share of any company in the e-cigarette market, the Centers for Disease Control and Prevention found. “By December 2017, Juul Laboratories’ sales comprised 29 percent of total e-cigarette sales,” a CDC team reported in the Journal of the American Medical Association. The Food and Drug Administration has been concerned about teen vaping in general, and Juul sales in particular, and said it had made an unannounced visit to Juul headquarters last week to look for evidence about the company’s marketing practices. “The Juul inspection, which we completed on Friday, sought further documentation related to Juul’s sales and marketing practices among other things, and resulted in the collection of over a thousand pages of documents,” the FDA said in a statement. The CDC’s Brian King says he knows what is going on: the company is selling exceptionally addictive products and is pushing them hard with sophisticated advertising and marketing campaigns. “You have a heavily promoted product, particularly in social media, that's available in kid-friendly flavors such as mango, crème brulee and fruit medley, and you also have high levels of nicotine in these products,” King told NBC News. Juul uses a form of nicotine called nicotine salts. It isn’t as harsh as the nicotine found in e-cigarettes, King said. “If you go back to your high school chemistry class, when you have a very high pH, it's very harsh on the throat, and then if you have tobacco products with very low pH, it's not as harsh,” King said. That makes for a predictable pattern. “Advertising can bring the horse to water. The flavors will get them to drink. And the nicotine will keep them coming back for more,” King said. Last month, the FDA declared teen vaping an epidemic and said statistics are coming that will show the stunning popularity of e-cigarettes among teens. In the meantime, the Rand Corporation published a study Tuesday that showed that teens who vape also go on to both vape and smoke more. “Our work provides more evidence that young people who use e-cigarettes progress to smoking cigarettes in the future,” Rand’s Michael Dunbar, who led the study, said in a statement. Dunbar and colleagues studied more than 2,000 Californians aged 16 to 20 over three years. At first, when the volunteers averaged 17 years of age, eight percent used e-cigarettes and six percent smoked combustible cigarettes. Just under three percent used both. By the time they were 19, that had flipped. Twelve percent of the youths said they smoked cigarettes while nine percent said they vaped. Plus, both vapers and smokers reported more frequent use over time, the Rand team found. E-cigarette supporters say their products can help smokers quit and provide a safer alternative while they do. The CDC and FDA say that is possible, but it has not been shown yet, and in the meantime heavily promoted and easily available vaping products are hooking a new generation on nicotine. “We know that cigarette smoke contains 7,000 chemicals and 70 carcinogens, so e-cigarettes are safer than cigarettes, but that doesn't mean they're safe,” King said. “The U.S. Surgeon General has concluded that e-cigarette aerosol is not harmless and it can include potentially harmful ingredients,” he added. Juul said it was cooperating with the FDA. "The meetings last week with FDA gave us the opportunity to provide information about our business from our marketing practices to our industry-leading online age-verification protocols to our youth prevention efforts," Juul CEO Kevin Burns said in a statement. "We've now released over 50,000 pages of documents to the FDA since April that support our public statements."